December 22, 2016—Older people who help and support others are also doing themselves a favor. An international research team has found that grandparents who care for their grandchildren on average live longer than grandparents who do not. The researchers conducted survival analyses of over 500 people aged between 70 and 103 years, drawing on data from the Berlin Aging Study collected between 1990 and 2009. Boston, MA; December 7, 2016—Having an optimistic outlook on life--a general expectation that good things will happen--may help people live longer, according to a new study from Harvard T.H. Chan School of Public Health. The study found that women who were optimistic had a significantly reduced risk of dying from several major causes of death--including cancer, heart disease, stroke, respiratory disease, and infection--over an eight-year period, compared with women who were less optimistic. August 10, 2015—Research reveals that most individuals with cancer have religious and spiritual beliefs, or derive comfort from religious and spiritual experiences. But what impact does this have on patients' health? Recent analyses of all published studies on the topic--which included more than 44,000 patients--shed new light on the associations of religion and spirituality with cancer patients' mental, social, and physical well-being. Published early online in CANCER, a peer-reviewed journal of the American Cancer Society, the analyses indicate that religion and spirituality have significant associations with patients' health, but there was wide variability among studies regarding how different dimensions of religion and spirituality relate to different aspects of health. May 4, 2015—Our view of what makes us happy has changed markedly since 1938. That is the conclusion of the psychologist Sandie McHugh from the Univeristy of Bolton who has recreated a famous study of happiness conducted in Bolton in 1938. She will present her study today, Tuesday, 5 May 2015, to the Annual Conference of the British Psychological Society in Liverpool. PITTSBURGH; December 17, 2014—Instead of an apple, could a hug-a-day keep the doctor away? According to new research from Carnegie Mellon University, that may not be that far-fetched of an idea. December 11, 2014— Researchers have found new evidence that explains how some aspects of our personality may affect our health and wellbeing, supporting long-observed associations between aspects of human character, physical health and longevity. November 17, 2014—Fatigue, increased irritability, and feeling demoralized, may raise a healthy man or woman's risk of first-time cardiovascular disease by 36 percent, according to a study led by researchers at Mount Sinai St. Luke's and Mount Sinai Roosevelt hospitals presented on Nov. 17 at the American Heart Association's Scientific Sessions 2014 in Chicago, IL. September 2, 2014—To get the most enjoyment out of our dollar, science tells us to focus our discretionary spending on experiences such as travel over material goods. A new Cornell University study shows that the enjoyment we derive from experiential purchases may begin even before we buy. September 2, 2014—We like to document the exciting and momentous occasions in our lives, but new research suggests there is value in capturing our more mundane, everyday experiences, which can bring us unexpected joy in the future. DARIEN, IL; July 2, 2014—A new study is the first to identify specific coping behaviors through which stress exposure leads to the development of insomnia. URBANA, IL; May 19, 2014—Maybe the numbers on the scale aren’t alarming, but that doesn’t mean that healthy-weight children get a pass on exercising, according to a new University of Illinois study published in Pediatrics. May 12, 2014—Feeling that you have a sense of purpose in life may help you live longer, no matter what your age, according toresearch published in Psychological Science, a journal of the Association for Psychological Science. May 2, 2014—Here’s another reason to drop that doughnut and hit the treadmill: A new study suggests aerobic fitness affects long-term memory. Research uncovers a simple and effective emotion-regulation strategy that has neurologically and behaviorally been proven to lessen the emotional impact of personal negative memories. April 18, 2014—What’s one of your worst memories? How did it make you feel? According to psychologists, remembering the emotions felt during a negative personal experience, such as how sad you were or how embarrassed you felt, can lead to emotional distress, especially when you can’t stop thinking about it. March 17, 2014—Why is being happy, positive and satisfied with life the ultimate goal of so many people, while others steer clear of such feelings? It is often because of the lingering belief that happiness causes bad things to happen, says Mohsen Joshanloo and Dan Weijers of the Victoria University of Wellington in New Zealand. Their article, published in Springer’s Journal of Happiness Studies, is the first to review the concept of aversion to happiness, and looks at why various cultures react differently to feelings of well-being and satisfaction. February 19, 2014—High family stress can lead to the child’s immune system being affected, as a research group at the School of Health Sciences at Jönköping University and the Faculty of Health Sciences at Linköping University in Sweden shows in a study being published in the renowned American periodical Journal of Immunology. February 11, 2014—As human beings, we expend a great deal of time, money, and energy in the pursuit of happiness. 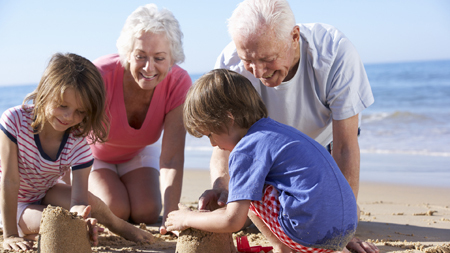 From exotic travel to simply spending time with our grandchildren, the things that make us happy change as we age. A new study in the Journal of Consumer Research explores the role of age on the happiness we receive from both the ordinary and the extraordinary experiences in our lives. January 23, 2014—Humans are able to smell sickness in someone whose immune system is highly active within just a few hours of exposure to a toxin, according to new research published in Psychological Science, a journal of the Association for Psychological Science. URBANA, IL; January 14, 2014—A University of Illinois study has identified the three most significant risk factors for child obesity among preschoolers: (1) inadequate sleep, (2) a parental BMI that classifies the mom or dad as overweight or obese, and (3) parental restriction of a child's eating in order to control his weight. Santa Barbara, CA; January 8, 2014—If you're one of the millions of people who count losing weight among their top New Year's resolutions, you might want to pay careful attention to some new findings by UC Santa Barbara psychology professor Brenda Major. December 2, 2013—Are you contemplating a skiing holiday? The all-out pleasure and enjoyment you experience on a pair of skis or a snowboard is positively priceless to enhance your overall happiness. This is true even if you only get to go out on the slopes once in a blue moon, says Hyun-Woo Lee and colleagues from Yonsei University in the Republic of Korea, in an article published in Springer’s journal Applied Research in Quality of Life. SAN DIEGO; November 10, 2013—New studies released today underscore the potential impact of healthy lifestyle choices in treating depression, the effects of aging, and learning. The research focused on the effects of mind/body awareness, exercise, and diet, and was presented at Neuroscience 2013, the annual meeting of the Society for Neuroscience and the world's largest source of emerging news about brain science and health. November 4, 2013—It seems everyone is looking for a culprit when it comes to childhood obesity: fast food, sugary drinks, super-sized everything. But it turns out part of the blame may lie with the simple matter of turning out the lights and rolling into bed. October 31, 2013—When faced with stress, some people seem to lose their appetite while others reach for the nearest sweet, salty, or fatty snack. Conventional wisdom tells us that stress eaters are the ones who need to regulate their bad habits, but new research suggests that stress eaters show a dynamic pattern of eating behavior that could have benefits in non-stressful situations. URBANA, IL; October 23, 2013—If you want to eat healthier when dining out, research recommends surrounding yourself with friends who make healthy food choices. A University of Illinois study showed that when groups of people eat together at a restaurant at which they must state their food choice aloud, they tend to select items from the same menu categories. October 11, 2013—A protein that is increased by endurance exercise has been isolated and given to non-exercising mice, in which it turned on genes that promote brain health and encourage the growth of new nerves involved in learning and memory, report scientists from Dana-Farber Cancer Institute and Harvard Medical School. September 1, 2013—To win the war against weight gain, it turns out that every skirmish matters—as long as the physical activity puts your heart and lungs to work. In a new study published today in the American Journal of Health Promotion, University of Utah researchers found that even brief episodes of physical activity that exceed a certain level of intensity can have as positive an effect on weight as does the current recommendation of 10 or more minutes at a time. A Wine a Day . . .
August 30, 2013—Drinking wine in moderation may be associated with a lower risk of developing depression, according to research published in Biomed Central’s open access journal BMC Medicine. The reported findings by the PREDIMED research Network suggest that the moderate amounts of alcohol consumed may have similar protective effects on depression to those that have been observed for coronary heart disease. URBANA, IL; August 12, 2013—A successful program that increased the number of fruits and vegetables eaten and decreased sugar-sweetened beverage consumption by 50 percent among Latino children had two secret weapons, according to a University of Illinois researcher. July 29, 2013—A good state of mind—that is, your happiness—affects your genes, scientists say. In the first study of its kind, researchers from UCLA's Cousins Center for Psychoneuroimmunology and the University of North Carolina examined how positive psychology impacts human gene expression. July 29, 2013—A new study, conducted by David Cutler, the Otto Eckstein Professor of Applied Economics, shows that, even as life expectancy has increased over the past two decades, people have become increasingly healthier later in life. June 20, 2013—Does your salad know what time it is? It may be healthier for you if it does, according to new research from Rice University and the University of California at Davis. Baltimore, MD; June 3, 2013—A large, multi-center study led by Johns Hopkins researchers has found a significant link between lifestyle factors and heart health, adding even more evidence in support of regular exercise, eating a Mediterranean-style diet, keeping a normal weight and, most importantly, not smoking. May 27, 2013—Stress and exhaustion may turn us into zombies, but a novel study shows that mindless behavior doesn't just lead to overeating and shopping sprees—it can also cause us to stick with behaviors that are good for us. BYU; May 22, 2013—In the long run, encouraging a baby to finish the last ounce in their bottle might be doing more harm than good. Compound in Mediterranean Diet Makes Cancer Cells "Mortal"
COLUMBUS, OH; May 20, 2013 —New research suggests that a compound abundant in the Mediterranean diet takes away cancer cells' "superpower" to escape death. URBANA; May 8, 2013—Tomatoes and soy foods may be more effective in preventing prostate cancer when they are eaten together than when either is eaten alone, said a University of Illinois study. WASHINGTON, DC; May 6, 2013—Regular exercise is touted as an antidote for many ills, including stress, depression and obesity. Physical activity also may help decrease violent behavior among adolescent girls, according to new research to be presented Monday, May 6, at the Pediatric Academic Societies (PAS) annual meeting in Washington, DC. New York; May 3, 2013—We all know that buying food when we are hungry is a recipe for disaster. When we are hungry, we can be especially sensitive to sights and smells of foods that will satiate, but may lack in nutrient content. What if we could make our meal choices when we are full, and not anticipating the feeling of satiation we all enjoy? Would we make healthier choices? ANN ARBOR, MI; April 22, 2013—Children can get five to 10 colds each year, so it's not surprising that adults often turn to over-the-counter cough and cold medicines to relieve their little ones' symptoms. But a new University of Michigan poll shows that many are giving young kids medicines that they should not use. CU, Boulder; April 10, 2013—For the first time, scientists have been able to predict how much pain people are feeling by looking at images of their brains, according to a new study led by the University of Colorado Boulder. ANN ARBOR, MI; March 13, 2013—For those with irritable bowel syndrome who wonder if stress aggravates their intestinal disorder, a new University of Michigan Health System study shows it’s not all in their head. URBANA, February 19, 2013—A University of Illinois study has established a possible link between high-fat diets and such childhood brain-based conditions as attention deficit hyperactivity disorder (ADHD) and memory-dependent learning disabilities. February 7, 2013, PULLMAN, WA—While sugary drinks, lack of exercise and genetics contribute to a growing number of overweight American children, new research from Washington State University reveals how a mom’s eating habits and behavior at the dinner table can influence her preschooler’s obesity risk. The findings come from WSU alumna Halley Morrison’s undergraduate honors thesis, which recently was published in the journal Appetite. Natural chemicals found in green tea and red wine may disrupt a key step of the Alzheimer’s disease pathway, according to new research from the University of Leeds. URBANA, IL; January 17, 2013—Childhood obesity in low-income families is a complex problem with many contributing factors. Some of these may include being part of a single-parent family, having a mother who has little education, and living in a poor neighborhood without easy access to healthy foods. But a recent study from the University of Illinois at Urbana Champaign finds that— even as these risk factors accumulate—low-income families who ensure their children participate in regular high-quality family mealtimes featuring positive interaction between family members showed a difference in their weight status. November 22, 2010—Nutrition has become a tricky subject. It shouldn't be so hard to figure out what to eat; after all, the birds and bees hardly seem to give any thought at all to their diet. But then, they haven't had the foresight to invent politics or financial interests—both of which intrude too often in the interpretation of research results on the human side of things. This spawns so many different and even opposing ideas about nutrition that we begin to feel like Dr. Doolittle's two-headed llama, the "push-me-pull-you." It's true that food—the right kinds of food—can nourish the brain as well as the body. But what is the "right" kind of food? August 23, 2007—Archaeologists have found evidence of wine and winemaking dating back to the earliest civilizations of mankind. The natural yeast in grape skins would have made the accidental fermentation of grapes almost a sure thing from the very beginning. It is speculated that even beer-drinking civilizations used "winemaking technology" to produce their drink of choice, since the addition of split grapes would have jump-started the process when added to barley. Throughout history, the wine trade could also be said to have jump-started many an economy, and contributed to the health and well-being of many people in many nations. Indeed, for centuries, wine has been considered an important part of a healthy diet. August 15, 2007—After immunosuppressants, the best medicine for organ transplant patients may be gratitude, says new research.